Because the world is governed by the Creator, who has a specific goal in all of His actions, hence anyone who breaks the laws of nature that were set by the Creator, harms the end goal, which is founded on the observance of all these laws without exception. And he who breaks even one law violates and harms the end goal that was set by the Creator, and will therefore be punished by nature (by the Creator via nature). The egoistic opposition between people and nations will disappear from the world only with the help of the Upper Force of the Creator (Nature), if we will desire unity with Him. This is initially implanted in the Thought of Creation. And if we aspire to this goal of adhesion with the Creator, then our envy, pride and hatred with disappear, and we shall assemble together into one heart, filled with the knowledge of the Creator. In our times, when every person is dependent on the whole world in order to provide for him, in the same degree every person becomes dependent on the whole world just like a tiny gear in a car. Hence, we can no longer consider the well being and safety of a certain country or nation, but only the world as a whole. After all, today the well being of everyone in the world depends upon and is measured by the well being of all the people in the world. And don’t be surprised that I link the well being of the individual with the well being of the society and even the whole world. In reality we have already reached a state where the entire world is regarded as one society. Today every person in the world is nourished by the entire world, and therefore must care for the well being of the whole world. Unity of the society is the source of happiness and well being, whereas separation between people is the source of all miseries. All fortunes and well being depend only on the drawing together and unification of the global community. My Comment: Baal HaSulam wrote the articles “The Peace,” “Peace in the World” and “Freedom of Will” back in 1924-1927! Question: Why are all the “wise people” in crisis? My Answer: Because it has become clear that their “wisdom” is in crisis! After all, it is human and earthly, not “Upper.” Only the wisdom of Kabbalah alone will become revealed to everyone – proudly alone, on the throne of the highest value. My Answer: Half of the world are still sick in the stomach just thinking of him! Today they still can’t recover from this mistake of forcefully imposing the condition of unity, mutual guarantee, brotherhood, communal property, and mutual means of production, as well as the consequences of this. How Will We Live In The Last Generation? Question: If people will rise to the highest spiritual degree, how will we live? What will we eat? Where will we sleep? How will we travel from one place to another? What will be our general form of existence? 1. Before the full correction, when our corporeal level of egoism is still not corrected. Hence even though we attain spiritual degrees, we still retain the sensation of this world. 2. After we are fully corrected, when even our corporeal egoism is corrected, we will cease perceiving this world. That’s because it is perceived precisely in this corporeal part of our desire, whereas we will sense ourselves as being fully and exclusively in the World of Infinity – the only true state. All the other states are partial states of its concealment. In Hebrew the word for “concealment” is Olama, and it is the root of the word “world” – Olam. Hence all the concealments of the one existing state of infinity are called worlds. In the article, “The Future Generation,” Baal HaSulam provides a detailed description of what life will be like before the attainment of the second state above. I have also written a book on this article, called The Last Generation. In addition, there are lessons on it in our online archive. Question: Did the sons of Israel accept the mutual guarantee after the exodus from Egypt? And what does the exodus from Egypt represent for us? My Answer: Yes, after their exodus from Egypt the sons of Israel (the group of Kabbalists, students of Abraham) accepted the condition of the “mutual guarantee” – an absolute spiritual bond between them, and the willingness to be as one soul of Adam. For them as well as for us, this signifies the complete unification into one desire (one soul). However, in our case this is no longer a unification of a portion of the “Babylonians,” but of the whole “Babylon” (all of humankind) in the joint desire of Adam. For more on this, see the article “The Arvut (Mutual Guarantee).” In it Baal HaSulam writes that the sons of Israel are just a transitional link intended to pass the method of egoism’s correction, Kabbalah, on to all of humankind. A question I received: You’ve been the leader and mentor of the Bnei Baruch group for nearly twenty years. Maybe it’s time to make a public summary? How many people have crossed the Machsom over this period of time, and how has the world changed as a consequence? Or is this no longer the objective today? Are you now simply trying to change the world without your students’ personal correction? I understand that this question will be deleted, but at least someone will read it. But if you do decide to publish an answer, then please don’t beat around the bush: give us real numbers and results, and the actual improvement in the world. Number of students in the world – around 2,000,000. Number of groups in the world – 73. Number of people who have crossed the Machsom – 19. Number of people who are about to cross the Machsom – 210. The rest will cross it by the year 2012. Annual growth of students – 700-900%. Number of hopeless students – 1. It’s you. Question: Why do you devote so much time to analyzing the crisis? Why should we care about the suffering of these oblivious and egoistic animals (or why should we pity them egoistically, since we can’t do it any other way)? My Answer: 1. These people are all close to me! 2. Just like everything else in the world, the crisis has a reason and a purpose. Its purpose is to bring out a need in mankind’s to reevaluate its behavior. The suffering will not stop until we accomplish this, and accomplish it right. I do the things I do in order to help people choose the correct attitude to what’s taking place, which will reduce the suffering. Soon enough this “oblivious and egoistic animal suffering” will affect you as well. When it does, please don’t forget to write to me about how your opinion changes regarding how much time people should devote to this problem. Question: Does it make sense to think of the reciprocal hatred (or lack of reciprocal love) that’s being revealed in the world as a reflection of the state the Bnei Baruch group is in, or my personal state? My Answer: The group and the world are interconnected, but are on different levels: the group depends on the world for its spiritual ascent, and the world depends on the group to reduce the force of the suffering that descends upon it (whether or not it wants to listen to the group). Question: Why is the unity of the common soul being revealed today from its reverse side? Do we really need to feel pain from realizing our connection to all people in the world? My Answer: This is the only way to convince people to correct their nature. Pain is the measure of our imbalance with Nature. And we’re the ones who establish its severity. News Report (translated from Israland): Hollywood will be affected by the global crisis as well. Nevertheless, film studios feel better than everyone else because most people prefer watching movies to watching the market keep plummeting. This is what happened during the Great Depression in America 80 years ago. My Comment: Man is a will to enjoy or be filled. His top two demands are “bread,” and “something to feast his eyes on” (a spectacle). It has always been this way throughout our entire history, when the ego was growing from one generation to the next. Only then will we become similar to Nature and the blows will stop coming at us. Even Hollywood will have to change its “spectacles” from egoistic to altruistic if it is to survive! 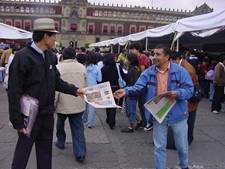 Our friends from Mexico report that 2,000 newspapers were given out in half an hour at the Zocalo Square in the center of Mexico City, where a book fair was being held. 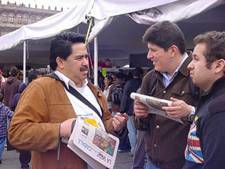 People were eager to take the newspapers; they asked questions about the wisdom of Kabbalah and about where they can study it. 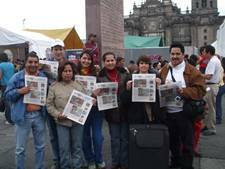 Latin America has discovered Kabbalah over the last several years. In every country and in every big city, there are groups of our friends and students, as well as many individual students who study on their own. Because of the enormous distances and expensive plane tickets, we are working on improving our virtual connection so it will create a total illusion of physical communication. Our souls are together anyway! By spring I hope to visit my Latin American students. 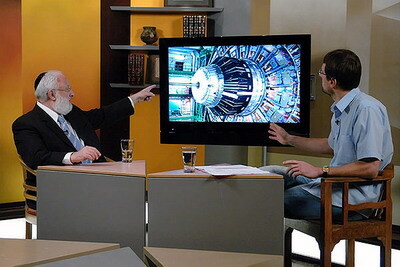 I had a conversation that was recorded about the Large Hadron Collider. I spoke with our friend and my long-time student, Dr. Valdas Rapsevichus, who is one of the participants in the global physics experiment in Switzerland. Summary: Physics develops to the extent that it acquires new experimental data. In the field of high-energy physics, no serious new data has been received in as long as thirty years. If new discoveries will be made with the help of the Large Hadron Collider – such as Higgs bosons, supersymmetry, and so on – then physics will be able to advance as a science, and will receive the funds to do so as well. However, if nothing new will be discovered, then the financing will stop and it will be the end of physics as a science. Laitman.com Post: Does G-d Play Dice with the Universe? A question I received: I am one of your students from India. My parents want me to get a PhD, but I’m not sure what to do. When I am not working, I spend my free time studying Kabbalah. If I were to start working on this degree, then I would have to devote my time to something that completely doesn’t interest me. I thought that perhaps I could compromise with my parents and get a PhD, but on a topic of my choice: “The Application of Kabbalah in Parenting and Education” or something along these lines. The problem is that our universities in India don’t have a Kabbalah department. They only have philosophy and religion departments. So where can I defend this dissertation? My Answer: Personally, I defended my dissertation on the topic, “Kabbalah as a Form of Irrational Knowledge,” in IPRAS – the Institute of Philosophy at the Russian Academy of Sciences. You can defend a dissertation on Kabbalah in any philosophy department at any university. Dissertations on Kabbalah are being defended in all Israeli universities at the philosophy departments. We have several Kabbalah doctoral candidates, including my youngest daughter. In addition, you can find out about defending it in America as well. However, I think that you should be able to come to an agreement on this topic in your university as well. I’m prepared to help you select the topic, choose materials, explain the thesis, and so on. As of today we’ve already published all the principal materials in English.